30 Mar Restaurants and Bars with a View. With the news that Johnnie Walkers are to include a roof top bar area in their new visitor centre at the West End of Princes street in the old House of Frasers building, got me to thinking of other bars and restaurants that have great views. 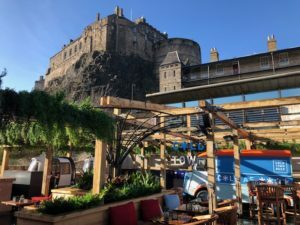 The Cold Town House opened late March of this year has a roof top beer garden with a spectacular view up towards Edinburgh Castle, with seating with many colourful scatter cushions and a couple of old ski lift gondolas available for those not so warm days. They not only brew their beer on the premises but serve a good range of food over the three floors with their speciality being pizzas using the same yeast for their dough as they use in making their beer. Another new addition to Edinburgh bar and restaurant scene is the Look Out restaurant on Carlton Hill. This restaurant run by Gardeners Cottage commands a great view over the New town of Edinburgh and up to Edinburgh Castle. Can be busy in the evening but they do a very nice continental breakfast so a good place to start the day off, with booking being recommended. Keeping in the New Town area, Harvey Nichols top floor restaurant has a lovely view over St Andrews Square and Edinburgh castle whether going for a full meal or tea and scone. Just along the street is Chaophraya Thai Restaurant on corner of George and Castle St where some of the tables have views up to Edinburgh Castle. Rather left field from what I normally try to promote is Zizzis Italian restaurant part of a chain but in a fantastic location, Roxburghe Court, off the Royal Mile with views from their windows looking back over Princes St Gardens, the monument to Sir Walter Scott and Princes street itself. On the rare occasion that the Skybar of the Doubletree is open to the public, the first Thursday of every month, as it is mainly used for private events. They have great views of Edinburgh castle and Princes street Gardens from an angle not usually enjoyed that often by the general public. If lucky enough to get a window table at the Outsider on George the IV bridge you will enjoy views of the Old Town and a back view of Edinburgh Castle. 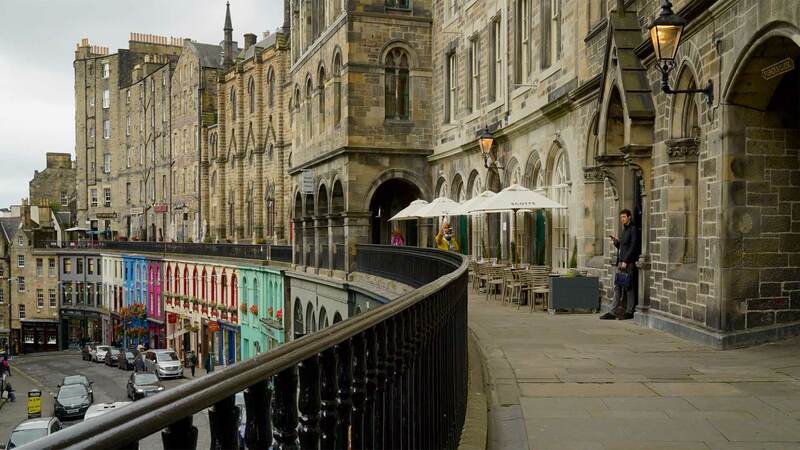 The Outsider offer a more than reasonably priced lunch menu and with its informal surroundings is a great place to while away a couple of hours in between sightseeing on the Royal Mile. If it more of a coffee and sandwich you are after just a couple of doors along is the Elephant House famous for, allegedly, being the birth place of Harry Potter. They too have lovely views out over the Old Town with theirs taking in George Heriots High School and Greyfriars Kirk graveyard where a few character names from Harry Potter can be found etched on some of the grave stones. 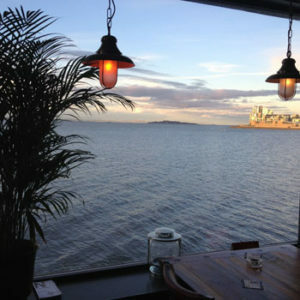 Moving away from the City centre down by the river Forth the Old Chain pier bar has lovely views out across the Forth to Fife and has a nice local feel with good range of bar food. Heading back in towards Leith is the Loch Fyne Seafood & Grill and The Fishmarket both having lovely views over Newhaven Harbour and both in their own way promoting Scottish seafood at its best. In Leith itself Tuecthers Landing has lovely views from the Conservatory at the back of the building over the river of Leith. Or If you just want to people watch, lovely views can be enjoyed in the Dome on George Street, Le di Vin in Randolph Place or Panda and sons cocktail bar in Queen Street. Restaurants and Bars with a View.